Tanzania has sentenced Yang Fenglan, a Chinese businesswoman nicknamed the "Ivory Queen", to 15 years in jail for smuggling hundreds of elephant tusks. Yang was accused of operating one of Africa's biggest ivory-smuggling rings, responsible for smuggling $2.5m (£1.9m) worth of tusks from some 400 elephants. The International Union for Conservation of Nature (IUCN), a global environmental body, says the population of African elephants has fallen to 415,000 - a drop of 110,000 over the last 10 years - as a result of poaching. 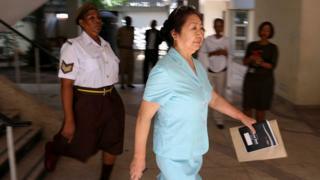 The court in Dar es Salaam, Tanzania's main city, has ordered Yang's property to be repossessed.